More background info: The historical background is, in all brevity, this: a Cistercian monastery was founded in this spot in the 12th century, and in the 13th century the abbot was sent to the Holy Land on a mission. On his return he scattered a handful of soil, which he had brought back with him, in the cemetery. This resulted in an upsurge in "popularity" of the site as a burial place – basically, everybody from the area who was anything (and some from further afield) suddenly wanted to be buried in this cemetery blessed by that handful of Holy soil. Add the dead from the plague in the 14th century and those from war times in the 16th century (including the murdered monks of the monastery), and the burial ground inevitably ended up "overcrowded". 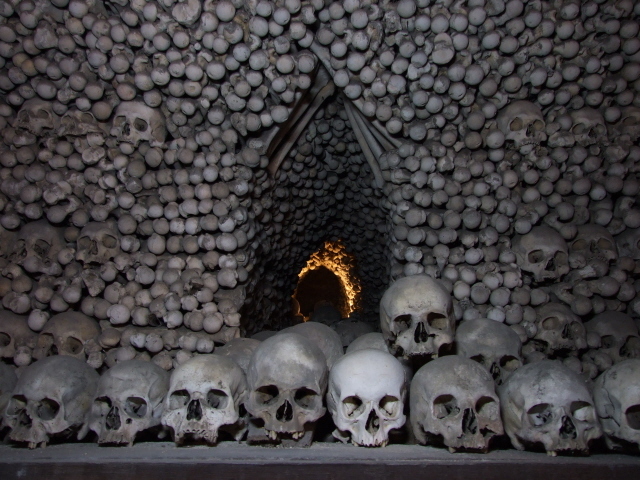 A new chapel was then constructed and – to make space in the cemetery – the old bones were piled high in the basement ossuary. These were rearranged a few times, but in particular by a local artist in 1870, who is credited with having given the artwork its current appearance. 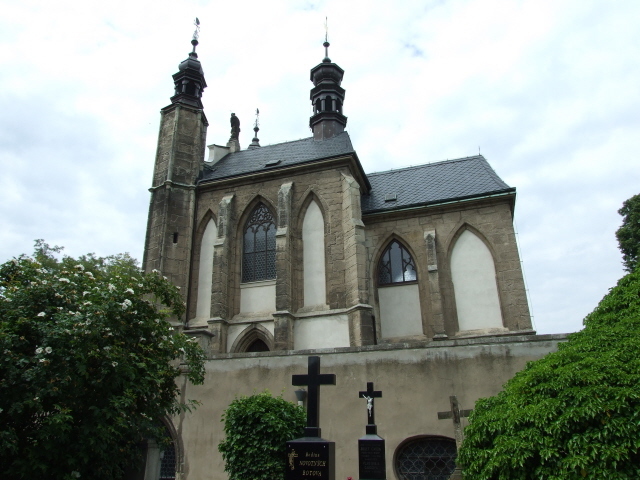 Note that the place is often also referred to by the longer Czech designation Kostnice Sedlec. What there is to see: bones, lots of bones, arranged into various shapes and patterns. 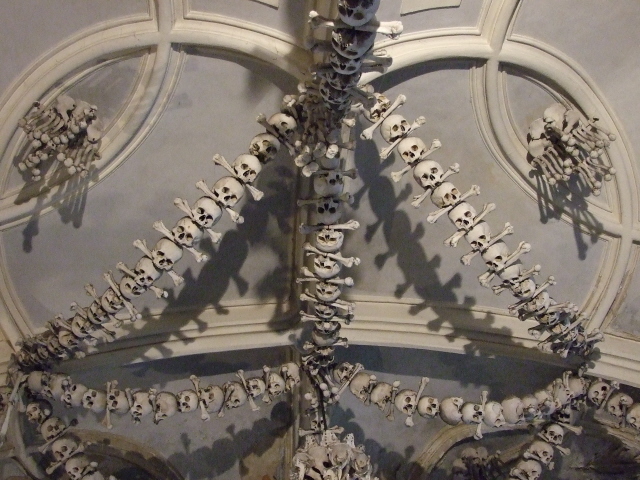 Chains of skulls hang from the ceiling, some bones form curtain-like shapes, others are arranged in the form of a coat of arms, vases, etc. The centrepiece (literally too) is a magnificent chandelier – allegedly made with every single bone in a human body. 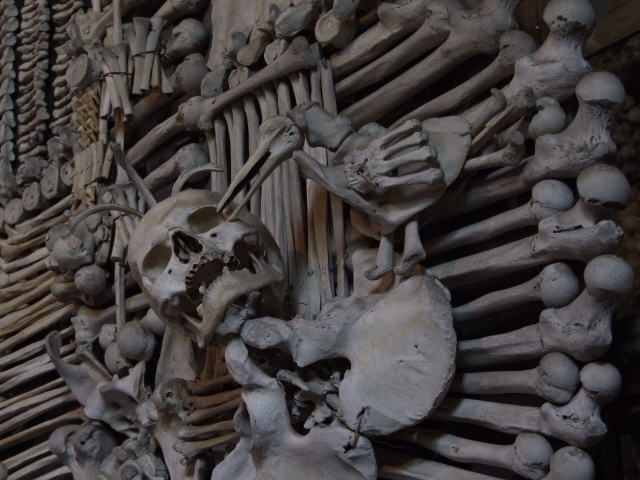 In the corners large heaps of bones and skulls are piled high behind wire mesh. 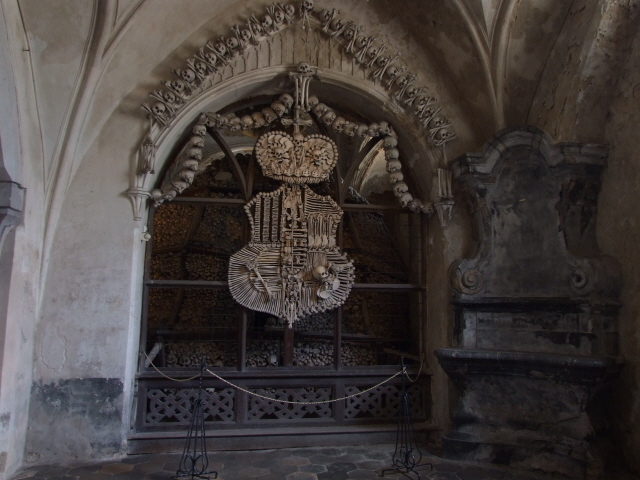 In front of the pile in the north-west corner of the chapel there is a particularly ornate coat-of-arms arrangement of bones – look out for the detail of bones in the shape of a bird that looks like it's pecking at a skull's eye sockets! A couple of glass cabinets contain skulls that show holes and fractures indicating the violent nature of their owners' deaths. A strange contrast is formed by four pyramid-shaped column-like structures around the chandelier – these are adorned on their sides by vertical rows of skulls (in keeping with the rest of the place) but on top sit little plaster cherubs, complete with little golden wings and horns … a surprisingly kitschy addition not quite so in keeping with the otherwise rather sinister atmosphere down here. Speaking of atmosphere: the place is on the itinerary of popular day excursions from Prague, so at times it can get quite crowded. If that happens when you visit, hang around a little longer. 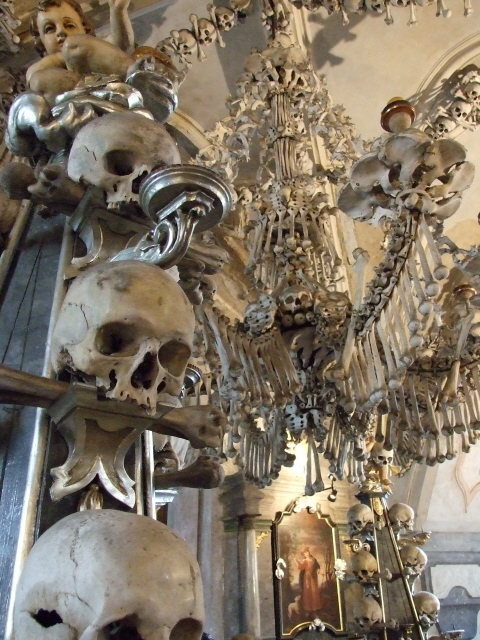 The groups never stay long – as for them the visit to the Sedlec Ossuary is little more than brief a photo stop worked into those pre-arranged wider-ranging Kutna Hora tours. So it's worth waiting until the place is empty/emptier and peaceful again. It certainly befits the place better. By the entrance there is also a little shop selling brochures, postcards and souvenirs, including small "decorative" skulls – and even "life"-size ones! Location: the little town of Kutna Hora some 45 miles east of Prague, Czech Republic. 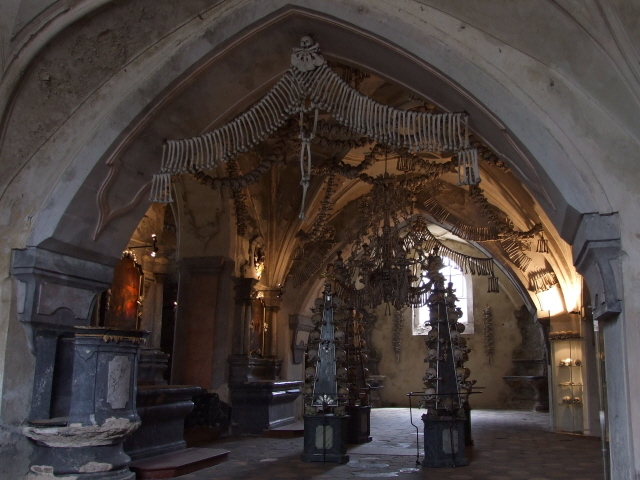 The chapel/ossuary is located in the (north-)eastern part of town beyond the centre, near the Sedlec train station. It is signposted "Kostnice" (from the Slavic root for 'bone'). Access and costs: not too complicated to get to, nor expensive. Getting there by car is obviously just as easy. The Sedlec chapel lies just off the main No. 2 road that leads west into the town centre or east to the No. 38 trunk road leading north to Kolin (follow signs for "Kostnice"). Parking is somewhat restricted but possible, if you're lucky you might even find one not too far away from the chapel. 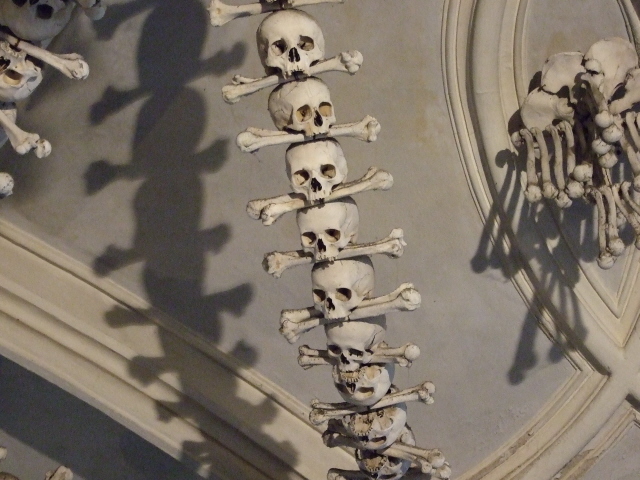 Alternatively, there are of course also those organized day trips from Prague – but only use those if you don't mind the "group atmosphere" (and the rather hefty price they charge compared to train ticket plus admission) and also want to be shepherded around the rest of Kutna Hora, which is part of the package. There is also a little "tourist bus" van providing a link to the town centre. Opening times: 8 a.m. to 6 p.m. in summer, only to 5 p.m. in October and March, and in winter 9 a.m. to 12 noon & 1 to 4 p.m. (closed Christmas). Admission: 90 CZK (student 60 CZK). In the past (when admission was much cheaper) an additional fee was levied for a photo permit, but thankfully this is no longer the case. Time required: Most people only spend 5-10 minutes max here, but it is worth taking a bit longer than that to soak up the atmosphere (and to make the most of the photography opportunities). Combinations with other dark destinations: Obviously nearby Prague – which is likely to be where most foreign visitors will be based when coming here – offers its share of dark sights. From there it's also a good idea to do the day trip to the former prison/concentration camp and museums at Terezin/Theresienstadt. Combinations with non-dark destinations: again, Prague is the closest mainstream tourist place. Although the rest of Kutna Hora itself, once an important silver mining town, with its many grand churches is also well worth a closer look.